We have been helping clients with their paving stones since 1986. Over the years we have found that many homeowners are not happy with the way their pavers look. 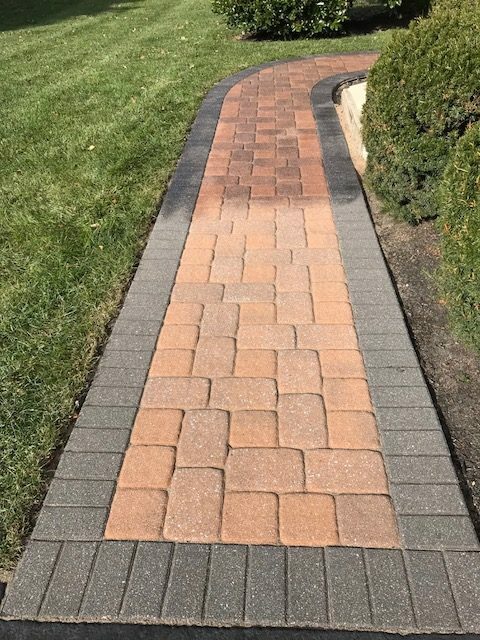 Paver Care and Repair offers paver repair, sanding, cleaning, and sealing services to restore, enhance, and protect your pavers for years to come. Paver Care and Repair is a full-service solution to fixing your paver pains. We are NOT a pressure washing company. We are NOT a landscaping company. We offer real solutions to real paver problems. Our full process typically includes four phases. However, you may choose only; repairs, joint sand replacement, or cleaning and sealing. Phase 1: A deep power washing and joint sand removal. Our power washing consists of high-pressure washing with a rotating head. This provides a deep cleaning between the paver joints. It is typical that the joints are removed to 1 – 1/2″ deep. The competition usually provides a cursory cleaning to a depth of 1/4 – 1/2″ Deeper cleaning means more polymeric sands in the joints. More sands equal more strength. The competition will sweep in a little sand and after one winter the sand will pop itself out of the joint. Phase 2: Repairs and joint sand replacement. Repairs and sanding take place following a typical one to two day drying period. Repairs of sunken pavers, low spots and incorrectly pitched areas will be addressed at this time. Following the repairs, the installation of HP polymeric sands will fill the joints. We use Techniseal HP Nexgel polymeric sand in all of our work. We use the best products to complete your job. Our installation process includes vibratory plate compaction. This process increases the sands strength by approximately 12% and decreases water absorption by up to 60%. Water is the worst enemy of your pavers and your paver application. Your patio, walkway, driveway, or pool area will be virtually weed free after we replace your sands. The competition skips the vibratory plate compaction step while we provide it twice to make sure the joints are vibrated full of sand. Polymeric sands need at least a week to cure. After this curing period, we return to a dry surface and apply a light acid cleaning and power washer rinse to remove any polymeric sand hazing and prep the pavers for the final step, the sealing. The final phase is the sealing. Following the acid clean, we typically return the next day to seal the pavers and finish rejuvenating your project. At this time we will spot treat any areas that need some additional polymeric sand. We also remove bird droppings, worms, or any other organic or inorganic material on the surface. Our sealers are heavily sprayed on and then back rolled. Our clients have a choice of two film-forming sealers. Clear Look provides a natural look finish with strong protection properties. WL4 provides a deep rich color enhancing appearance with a satin finish. It too provides strong protection properties. Depending on weather conditions, you can typically expect up to 3 years of protection from either sealer. Paver Care and Repair stand behind our work and our products. We offer a satisfaction guarantee. Unlike other products or services, if something is going to go wrong, it will happen quickly. We will resolve the problem to your satisfaction and ours. We also offer a non-whitening guarantee on our solvent based Wet Look Sealer (WL4). If it should turn white in spots we will remedy at no additional cost to our client.